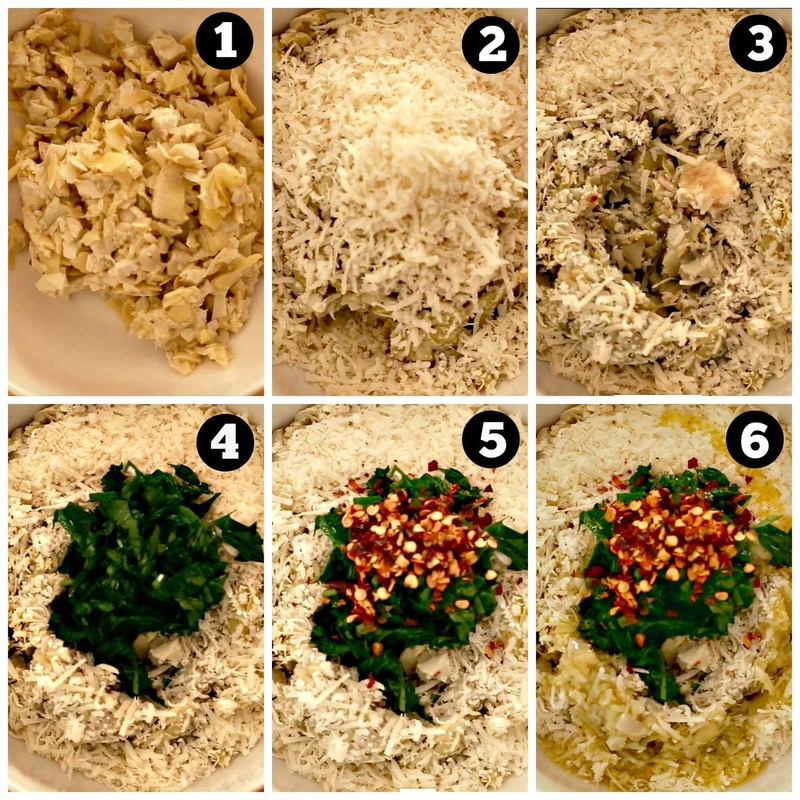 An easy Artichoke Dip Recipe made with a handful of simple ingredients and takes less then 10 minutes from start to finish! This cold dip will be the hit of any get-together with it’s marinated artichoke hearts, Parmesan cheese, roasted garlic, olive oil, and red pepper flakes. Let’s all give a big heck yeah for an artichoke dip recipe that takes only 10 minutes to make! Easy appetizers are always a big plus around my house during this time of year. Between game day weekends, the holidays, and friends stopping by for impromptu visits, I’m always on the lookout for a new recipe. This artichoke dip recipe was created when I needed an appetizer one Saturday to munch on while watching college football games. Unfortunately, my refrigerator was lacking in munchie makin’ ingredients, besides some Parmesan cheese and fresh parsley. Peering into my pantry, I found a bag of pita chips and grabbed a jar of marinated artichokes. It was time to go to work making a quick artichoke cheese dip. 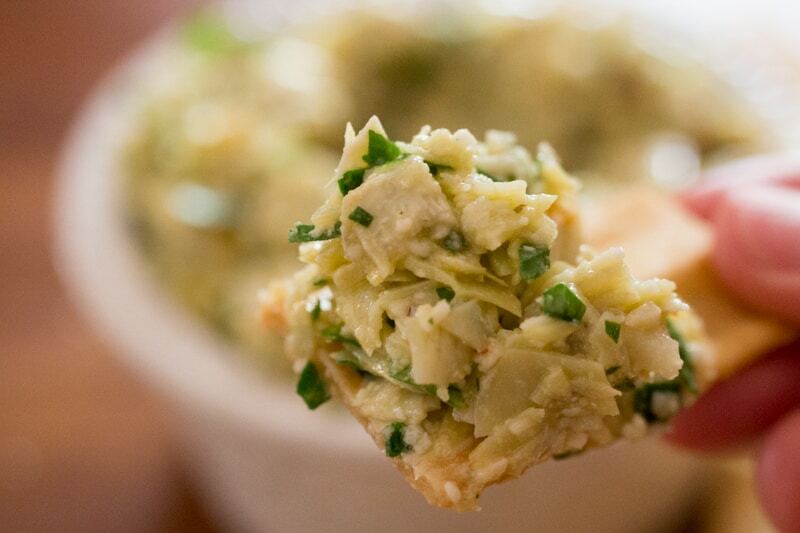 Using marinated artichokes and roasted garlic in this dip really add extra layers of flavor. Don’t be daunted by roasting garlic because it’s so easy to make. I always use this recipe here as a guideline. Out of convenience, I roast a couple of heads of garlic at one time and store leftovers in the refrigerator (short term) or freezer (long term). Whenever I need roasted garlic, it’s always ready! Don’t want to roast garlic? No problem! Feel free to substitute regular fresh garlic, that’s been mashed to a paste. The dip will still have the garlic flavor, just lacking a little in the sweet caramelized flavor. Make this artichoke dip when you need a quick appetizer. Want a hot artichoke dip recipe instead? Try this classic Spinach and Artichoke dip recipe and happy munching! Made with a handful of simple ingredients and takes less then 10 minutes from start to finish! 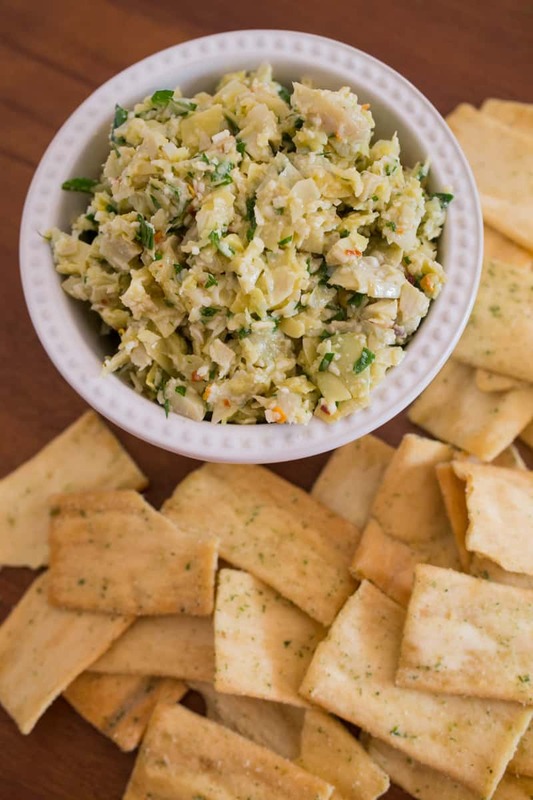 This cold dip will be the hit of any get-together with it's marinated artichoke hearts, Parmesan cheese, roasted garlic, olive oil, and red pepper flakes. Combine all ingredients in a medium sized bowl and mix until well combined. Start with 1/4 cup of olive oil and add extra, if needed, to bind it all together. Serve immediately with crackers, pita chips, tortilla chips, and/or assorted cut vegetables, or cover and place in the refrigerator until ready to use. Take a whole head of garlic and gently peel off the outer layers of the skin, leaving the cloves attached. Cut off top of the garlic head to just expose the inside of each clove. Place on a piece of foil and drizzle with enough olive oil to coat the garlic. Wrap up with the foil and roast at 400F/204C degrees for 30-40 minutes, until lightly brown and tender. Remove and let cool. Gently squeeze garlic from their skins into a container (with a tightly covered lid) and cover the garlic with olive oil, then store in the refrigerator for up to 3 days. Dip can be served at room temperature or cold. Store leftover dip tightly covered in the refrigerator for up to 1 week. I could totally veg out and eat the entire bowl. Girl, you know it’s true………. I do know it’s true that you can eat an entire bowl of this dip. Such a unique dip! I love when you can make something delicious out of a few things found in your fridge/pantry! And roasted garlic? Bring it on! Love that stuff! The best recipes come from raiding the frig and pantry! I’ve never made artichoke dip!! I absolutely love it when I order it at a restaurant though, so I just know I’d be all over this!! Great recipe Karrie! WHATTTTTT??? Never made an artichoke dip??? 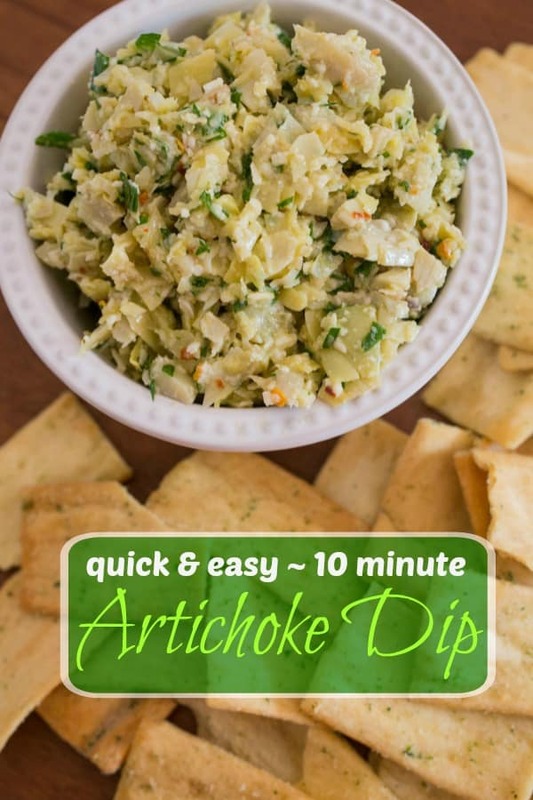 Girl, you’ve got to go get some artichokes and make a dip ASAP! lol! Interesting! 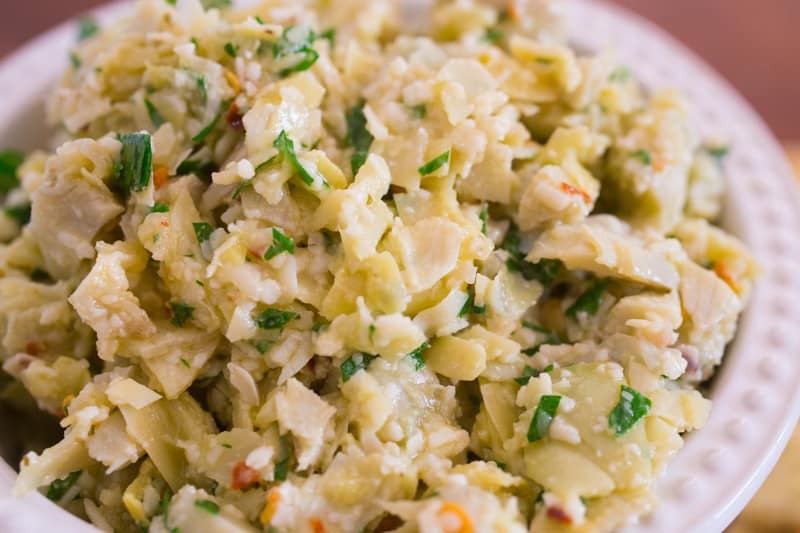 I never would have thought you’d use marinated artichoke hearts. Now I like it even more! When you say cold, do you mean room temperature? 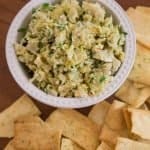 Marinated artichoke hearts are so good in this dip, Mimi! Actually it can be served cold right out of the refrigerator or at room temperature. Thanks Jeff and if you try the dip, please let me know how you like it! I love how fresh and zesty this artichoke dip is! Great idea! Thanks Kelly and it’s so quick to make! I can’t wait to make this. I love artichoke dip and this one looks fantastic!! I am so glad you can make it in less than 10 minutes. Thanks for sharing. Thanks Katie and I could eat my weight in artichokes! It is so nice when you can whip together a snack this quickly right from what you have in your fridge and pantry. Totally agree Karen! Simple recipes are the best. I love artichokes and I love roasted garlic so this dip is right up my street! I could put artichokes and roasted garlic in everything! This looks great! I’m usually used to a super cheesy creamy version of artichoke dip but I am definitely giving this one a try. It looks like it actually lets the artichoke take the stage. Thank you Billy and the super cheesy creamy ones are so good too! This one is definitely more about the artichoke.